I think this has been the hardest sample to get done to date. Not because it has been especially hard; but, because of the grommets. Yes, the grommets. I picked out the grommets from our storage unit and distinctly remember putting them in my purse. And, I also distinctly remember how heavy my purse felt soon after. And, I distinctly remember taking them out of my purse. However, I cannot for the life of me remember where I put them. So a week goes by and Robin and I finally make it back to storage to look for another package of grommets. After at least 1/2 hour, we find them. We were so excited to find them we left to go shopping. This is what we do best after all. Don't you know that we left the package of grommets still in storage. 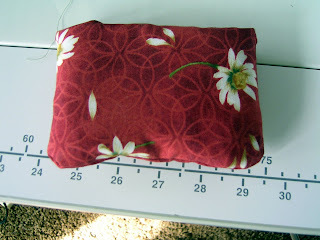 Here is the fabric that the Grids and Grommets purse will be. It is partially constructed and once I get a package of grommets, I will post another picture. Don't hold your breath. Just a peek at another sample in the making. 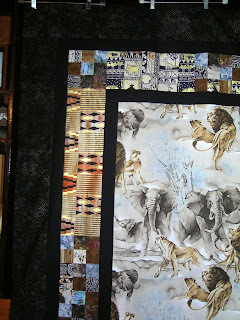 The center will be the lions and elephants with borders around. I have only taken a partial picture. I have an appointment to quilt them on Tuesday. Terri and Tillie are giving me time on the long arm. I will then post all three new samples. Only one more to go before IQF in July. I finished another sample. 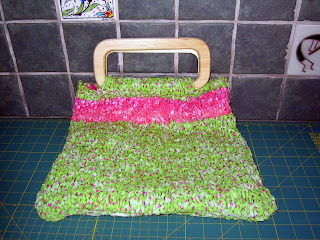 This is something you can do with all that fabric stash just sitting around. You know, the stash you bought a long time ago and now wonder why? Perhaps it was only the color after all. Here is what I do with some of my unused stash. I knit with it. 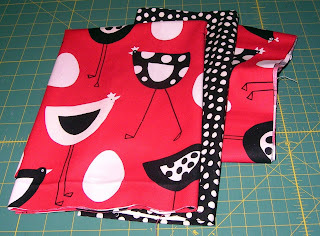 Oh, alright, sometimes I buy fabric just for this; but, you don't have to. I must tell you that not ALL fabric works with this. Sometimes it can be just too ugly. I started this "sample" using an ugly fabric that just didn't get any better with knitting. It was already cut and rolled into neat little balls and I thought that it would save time. And, it should have. Only as I went along, it actually got depressing it was so bad. That is when I took it off my needles and marched over to the circular file and dumped it. Too bad I didn't get a picture first. 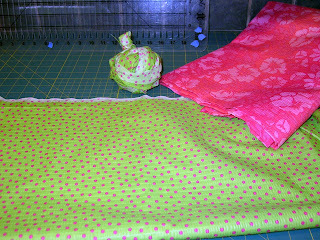 But you can see the happy fabric I decided to use. You know how some days are just better than other days? Today may be one of those days. I am a part of a swap with a great group of women. The swap is called Christmas in July. We each have one person we swap sending nine small gifts that spell out C-H-R-I-S-T-M-A-S. My partner is Diana from Oz and I have have had a good time getting all this together. And, I have been feeling very smug because I finished sooner than I thought I would. Then I found out it wouldn't fit into the Flat-Rate box. Today I stopped off at my favorite Target and picked up a padded envelope. Believe me, it was a chore stuffing everything inside. With help from my Mom, I managed to seal it. Then I was nevous with all the bulges and used enough tape on it to seal the entire house. 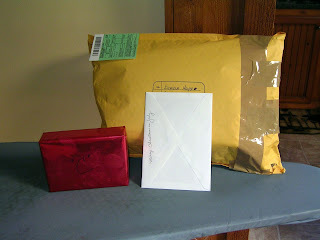 After I put the address on it and filled out the customs slip, over by the side of the couch I spot the card. I am not opening this package. Oh well, I can send that card all by itself. I address the card. All set right? Not so fast; then on the sofa I spy a small red box, labeled "C". Horrors. Even if the package was still open, it would never fit inside (and I am fairly certain, I have the largest padded envelope they make). Now I have to stop and pick up another padded envelope to stuff the box into. I'll do that when I pick up my Poochon from the groomers. Diana, I promise there is a "C" in CHRISTMAS. I made this sample, which folds into its own pocket, last night. It literally takes one-half yard and one-half hour to complete. 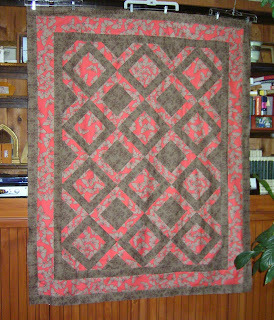 We will have both the pattern and kits for sale at the International Quilt Festival in Long Beach. It's cute isn't it? I am one of Two Wacky Women and I am getting ready for the International Quilt Festival in Long Beach. This means sample sewing. I have recently completed two quilt tops to kit. 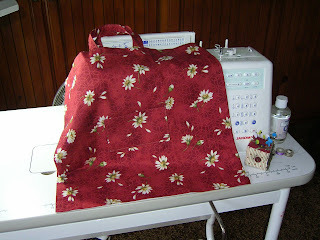 The first is based on Robin's pattern (which is wildly popular right now) Magnolia Lane. The fabric is Monarch by Free Spirit. What a fun, quick and easy pattern to spend a couple of days making. Now to quilt it. To quilt it myself or take it to my long-arm quilter. It clearly depends on what kind of time I will have as things get closer. 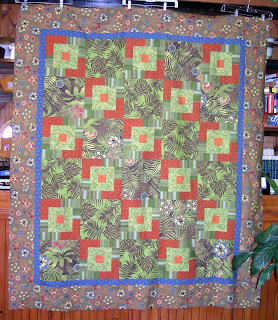 This quilt top (also waiting to be quilted) is called Brazilia. Fabric and pattern both by Hoffman International of California. Another quick and easy pattern utilizing the new blended color schemes.